You want to use pattern blocs with your students in a fun and easy way? 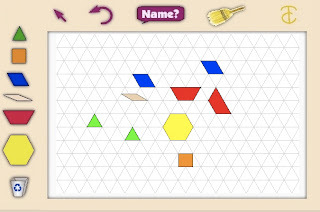 This pattern blocs application let your students use pattern blocs virtually on the computer. The blocs are exactly the same as the one you have at school (yellow hexagon, red trapezoid,, green triangle, blue parallelogram, wooden lozenge, orange square). Students can move them and rotate them. They can put them side-by-side or have them overlap. It is also an excellent tool to assign homeworks with the pattern blocks without the need to send boxes of pattern blocks home.